Origin and Habitat: Boophone haemanthoides is endemic to the west coast of Southwestern Namibia Coastal regions of Northern Cape and Western Cape (South Africa). Habitat and ecology: Succulent Karoo.This species grows in a winter rainfall area on sand dunes not far from the coastlines and on limestone flats, rarely on granite outcrops, in several vegetation types particularly on north-facing slopes. The annual rainfall is as minimal (less than 200 mm) and erratic. B. haemanthoides is a long-lived and slow-maturing relic species that has retained its summer-flowering rhythm, co-exists with the short-lived, autumn-flowering and generally more opportunistic Hessea pilosula, one of several species in the genus that occupy a wide range of habitats in Namaqualand. B. Haemanthoides will survive periods of extreme aridity, and produce seedlings during wetter summers where thunderstorms might play a greater role in moisture amelioration. The seeds are covered with a thin corky layer, which protects them during the hot summer months, until favourable conditions for germination return in autumn. The thick layers of papery tunics surrounding the bulb provide protection from scorching summer heat during the dormant period. The plants often experience sub-zero temperatures in winter. There is no record of medicinal use of this bulb but many have been lost as large parts of its habitat have been cultivated. Bulb: Massive, solitary, glabrous, epigeous, ovoid to globose, to 18 cm in diameter. 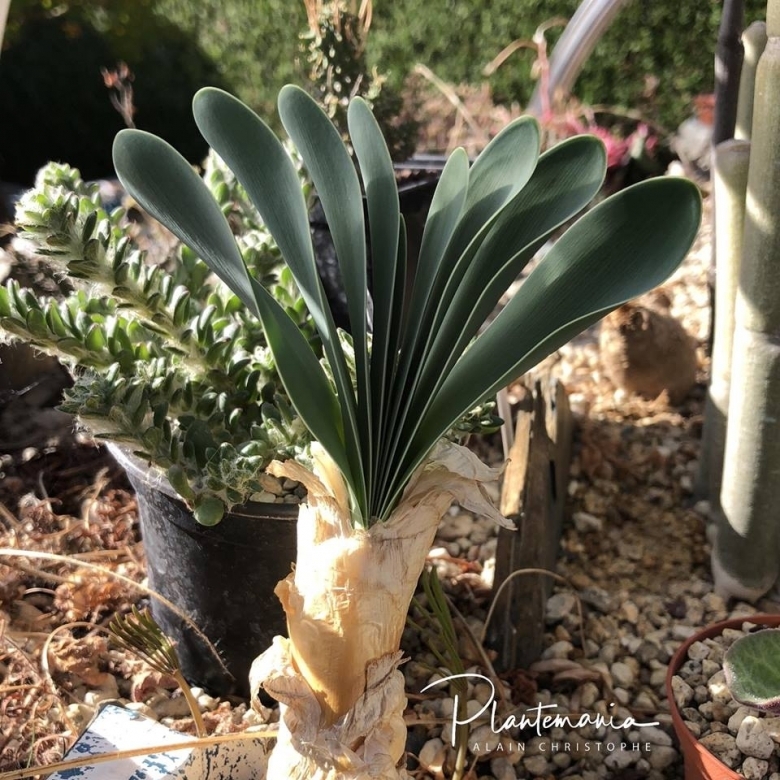 The bulb is protected by thick grey or brown, papery and firm outer tunics and leaf bases in a vaguely corky outer layer, probably offering some protection from drought. Leaves: Up to 20, distichous ( produced in 2 opposite rows in a spreading fan), 15-30 cm long, 5-10 cm wide, oblong, coriaceous,, intensely glaucous (grey-green), inner erect becoming spreading. The leaf surfaces are flat or slightly to deeply channelled the margin is entire and vary considerably from straight to slightly or strongly wavy. The tip is obtuse. The leaves start turning brown, prior to withering in spring. Inflorescence: Peduncle firm, thick, maroon, pinkish brown or yellow, to 25 cm tall and 3 cm wide, strongly compressed emerging from the centre of the bulb from early to mid-summer, after the leaves have died back. The flowers are numerous in a dense brush-like umbel (flower head). The umbel is enclosed by 2 oval-shaped suberect, pink or red, bracts to 14 cm long, 8.5 cm wide. Pedicels 5-10 cm long. Flowers: Sweet-scented ,actinomorphic (regular), creamy-yellow becoming reddish with age. Perianth tube straight 5-7 mm long, 6-angled with deep grooves. Tepals erect or spreading, thin, more or less linear, erect at anthesis, and initially white, cream-coloured or light yellow, ageing to dull pink. The stamens protrude strongly, and have pink or light yellow filaments, with maroon or cream-coloured unripe anthers. Fruits: Initially, the flower stalks are erect or suberect during the flowering stage, then radiate and lengthen substantially during the fruiting stage, to form a spherical infructescence (fruiting head). The ripe fruit is a strongly 3-angled, papery capsule, containing 1 to several, round, fleshy seeds, which are covered with a thin corky layer. B. haemanthoides are exceptional in having infructescences which detach from the scape distally. The resultant dispersal unit lacks symmetry and appears to lose its integrity rapidly. 5) Esler, K, J, 1998, "Unusual geophytes of the Succulent Karoo: How form can relate to function." Veld Fr Flora, 84 (1). 6-7. 6) Snijman, D, A, 1999, "Growth periodicity, flowering and phylogeny of the African Amaryllideae (Amaryllidaceae)", In: Timberlake,J. And Kativu, S. Eds, "African plants: biodiversity, taxonomy and uses". Royal Botanic Gardens, Kew. Pp 389- 404. 8) Du PLessis, N.M. & Duncan, G.D. 1989. "Bulbous plants of southern Africa". Tafelberg, Cape Town. 9) Duncan, G. 1980. "Skaars inheemse plante van die Saldanha-Langebaan veld". Veld & Flora 66(2): 49–51. 10) Duncan, G.D. 2010. "Grow bulbs. Kirstenbosch Gardening Series". South African National Biodiversity Institute, Cape Town. 11) Duncan, G., Jeppe, B. & Voigt, L. 2016. "The Amaryllidaceae of southern Africa". Umdaus Press, Pretoria. 12) Jackson, W.P.U. 1990. "Origins and meanings of names of South African plant genera." University of Cape Town. 13) Low, B. 2001. "Boophone haemanthoides". Veld & Flora 87(2): 64–66. 14) Manning, J. & Goldblatt, P. 2007. "Nieuwoudtville: Bokkeveld Plateau & Hantam". "South African Wild flower Guide 9". Botanical Society of South Africa in association with the National Botanical Institute, Cape Town. 15) Nair, J.J., Rárová, L., Strnad, M., Bastida, J. & Van Staden, J. 2013. "Alkaloids from Boophone haemanthoides (Amaryllidaceae)". Natural Product Communications 8(12): 1705–1710. 16) Tsang, D. 1998. "Boophone ernestii-ruschii, a living diamond in south-western Namibia". Herbertia 53: 145–151. Cultivation and Propagation: This cream and red-flowered species is rare in cultivation. Although not difficult to grow once established, it can be tricky when young, so keep plants shaded for their first year.